The FLC assays most frequently used as an alternative to Freelite are the Siemens N Latex FLC assays. These assays are based on monoclonal antibodies and have been used in a number of evaluation and comparison studies, and are described in most detail in this Section. Limited peer-reviewed publications are available for the polyclonal antisera-based Sebia FLC ELISA assays and the monoclonal antibody-based Seralite-FLC lateral flow assays, which are also briefly mentioned below . Figure 8.3. Precision of Freelite and N Latex FLC assays. Thick lines below the axis represent Freelite and N Latex FLC measuring ranges at the standard dilution, individual standard values are indicated (filled circles). (Reproduced by permission of SAGE Publications Ltd., London, Los Angeles, New Delhi, Singapore and Washington DC, from  [©Pretorius, 2012]). Figure 8.4. Bland-Altman plots comparing patient results for two batches of N Latex FLC reagent. (A) κ sFLC, (B) λ sFLC. The variance predicted from precision is indicated by the shaded area. (Reproduced by permission of SAGE Publications Ltd., London, Los Angeles, New Delhi, Singapore and Washington DC, from  [©Pretorius, 2012]). A better-designed precision study by Lock et al. used samples that either fell within the reference range or were moderately elevated by both FLC assays. The authors concluded that the within-batch and between-batch precision of both Freelite and N Latex FLC assays was acceptable (Table 8.3). A report by Sharrod-Cole et al. reached similar conclusions. Finally, Carr-Smith et al. used UK NEQAS external quality control data to compare the inter-laboratory variation of Freelite assays on the SPAPLUS® with that of N Latex FLC assays on the Siemens BN™II. The authors conclude that the performance of Freelite was at least equivalent, and often superior, to N Latex FLC for the majority of distributions (Section 39.3). Maintaining batch-to-batch consistency is an essential requirement for any FLC assay, which may be used to monitor patients over the course of many years. Freelite polyclonal antisera are produced using standardised manufacturing procedures that include careful blending to achieve balanced, reproducible recognition of FLC molecules, with good between-batch consistency. This is further discussed in Section 5.5. Table 8.3. 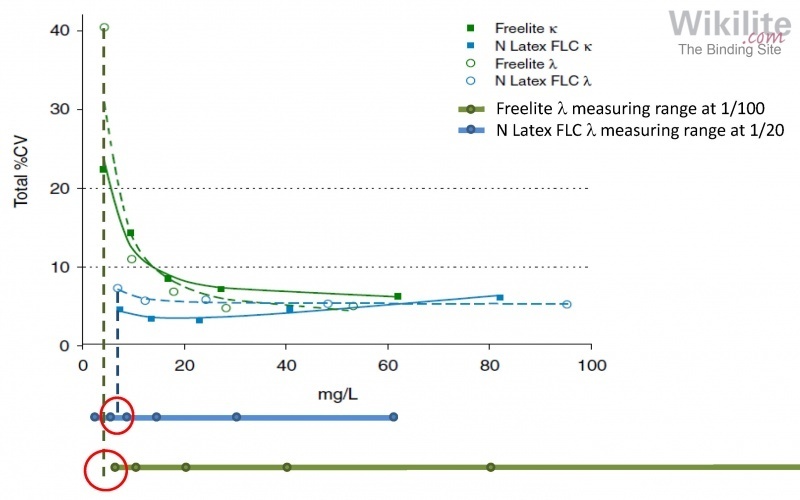 Precision of Freelite and N Latex FLC assays . Reproducibility data based on 10 replicates, except N Latex FLC between-batch which was based on 3 replicates. A theoretical advantage of monoclonal over polyclonal antibodies is reduced variation between reagent lots. Pretorius et al. assessed variance between two N Latex FLC reagent lots, calibrated with the same material. Whilst the κ N Latex FLC assay demonstrated negligible bias (-1.7%), the λ N Latex FLC assay demonstrated significant bias (-5.4%). For both κ and λ N Latex FLC assays the difference in values for a number of samples was >20% (Figure 8.4). This included one notable extreme value which showed a >80% difference in λ sFLC concentration between reagent lots (Figure 8.4B). This indicates that use of monoclonal antibodies does not eliminate between-batch variation. Occasional sample non-linearity (i.e. when a sample measured at different dilutions gives a substantially different result) occurs with most immunoassays. Examples of sample non-linearity with Freelite assays are described and discussed in Section 7.4. Pretorius et al. reported that sample non-linearity occurred in approximately half of all monoclonal and polyclonal samples, with both Freelite and N Latex FLC assays. The authors concluded that non-linearity of FLC assays is a property of the individual sample and not a method-specific phenomenon. Freelite assays undergo validation during development (based on protocols defined by the Clinical and Laboratory Standards Institute) to ensure that the assays are linear (Section 5.6). Antigen excess causes immunoassays to underestimate high concentrations of protein (Section 7.5). Freelite antigen excess checks can be performed on all platforms, and are carried out in one of two ways: 1) automatic prozone parameters, e.g. Binding Site SPAPLUS® and Optilite®; or 2) a sample dilution protocol detailed in the product insert, e.g. Siemens BN™II. Freelite antigen excess is further discussed in Section 7.5. The Siemens N Latex FLC assays include antigen excess detection parameters based on a pre-reaction protocol. For the pre-reaction, a small volume of sample is initially added, followed by the rest of the sample for the primary reaction. If the signal at the end of the pre-reaction is above a certain threshold value, the instrument automatically performs a higher dilution . te Velthuis et al. described the initial validation of N Latex FLC antigen excess parameters. In that study, over 2,000 serum samples were screened to identify the two with the highest concentration of κ or λ sFLCs: 23,000 and 57,000 mg/L, respectively. Serial dilutions of these two high samples failed to demonstrate antigen excess. However, this protocol does not provide a good assessment of antigen excess susceptibility because 1) only two samples were tested; and 2) they were chosen in a manner that was most likely to select samples not subject to antigen excess. Jacobs et al. compared the results from Freelite and N Latex FLC assays for 46 samples containing polyclonal or monoclonal sFLCs and using multiple sample dilutions. For monoclonal κ FLCs measured by Freelite or N Latex FLC, the discrepancies of concentrations between different dilutions were sometimes large. In addition, λ sFLC concentrations were underestimated at higher concentrations by both methods. However, this study failed to give a clear definition of non-linearity or antigen excess and the incidence of neither phenomenon was reported. Two further studies compared the incidence of antigen excess and gross non-linearity for Freelite and Siemens N Latex FLC assays by testing samples at higher sample dilutions on the BNII . Harding et al. reported that κ sFLC antigen excess was observed in 3/91 (3%) samples by Freelite and 4/91 (4%) by N Latex FLC; all cases of Freelite antigen excess were correctly identified using the manufacturer’s dilution protocol. λ sFLC antigen excess was not observed with Freelite assays, in keeping with previous reports that suggest that these λ assays are less prone to antigen excess than κ assays (Section 7.5.3). In contrast, 3/91 (3%) of samples showed λ sFLC antigen excess with the N Latex FLC assay. Burden et al. reported that a proportion of samples measured with κ or λ N Latex FLC assays gave results that were 5-9 times greater at the higher sample dilution compared with the result at the initial dilution (Table 8.4); this is indicative of antigen excess despite the fact that the assays should have automatic protection from antigen excess issues. Table 8.4. sFLC concentrations measured by N Latex FLC and Freelite assays at several sample dilutions . NR: not reported. Therefore, it should be noted that: 1) both Freelite and N Latex FLC assays show antigen excess in a small number of samples; 2) antigen excess parameters utilised in the N-Latex assays do not prevent all samples from exhibiting antigen excess; and 3) discrepant results between the two assays could be due to antigen excess. This third point is discussed further in Section 8.6.3. Evidence of antigen excess for the N Latex FLC k assay was reported by Bossuyt et al. . The study included a total of 730 samples (n=525 MGUS and n=205 MM), which were measured at two dilutions on the BN ProSpec: the standard dilution and a 20-fold higher dilution. Antigen excess was missed for six samples, all of which contained monoclonal k sFLCs, as well as a monoclonal IgAk intact immunoglobulin. The antigen excess capacity of the Sebia FLC assays has not been rigorously tested. The combined number of samples included in the two studies published to date totals only 30 . Therefore, further studies are required before conclusions can be drawn about the antigen excess protection in these ELISA-based assays. One potential advantage of Sebia FLC ELISA assays are their broad measuring ranges, which reduce the requirement for sample dilution. Jacobs et al. reported that the proportion of κ and λ samples that required redilution was 33% and 30% for Freelite assays on the BN™II, compared to 9% and 7% for Sebia FLC ELISA assays. However, other studies have reported lower redilution rates for Freelite assays on Binding Site instruments (Section 7.3). When considering the effect of sample redilution on laboratory workflow, assay time should also be taken into account; Freelite immunoassays are far more rapid than Sebia FLC ELISA protocols, with an approximate assay time of 15 minutes vs. 2 hours. 2. Jacobs JFM, de Kat Angelino CM, Brouwers H, Croockewit SA, Joosten I, van der Molen RG. Evaluation of a new free light chain ELISA assay: Bringing coherence with electrophoretic methods. Clin Chem Lab Med 2018;56:312-22.